VCS is how one tracks changes, modifications, and updates to source files over time. Creating a history of changes for a project over time. I have changes I want to integrate (merge) into the main project. I want to track the state of this project over time. I want to make some changes without possibly breaking what I have. Most VCS software does this by storing metadata about a project, specifically differences (diffs) between between points in history. VCS is a broad and complicated topic. It might not come easy to you, but experience will help. Below is a list of concepts / vocabulary you’ll encounter when working with VCS. Some systems use slightly different verbiage to describe these ideas but you can get by with these words. The delta (additions and deletions) between two states of a project. A snapshot of your project’s state at a point in history. Records the difference between two points in history with a diff. Modifications to a project (main branch = trunk) made in parallel with the a main branch, but not affecting the main branch. Introducing changes from one branch into another. Downloading a local copy of a project. Your own version of somebody else’s project where you take the original code-base and make modifications. May include many changes or just a few bug-fixes. Sometimes you end up merging those changes back upstream. There are two main types of VCS: distributed and centralized. They each have their pros and cons. Centralized Version Control Systems require a persistent connection with a centralized server. Distributed version control systems are those in which each person working on a project downloads a local copy of the project, makes their changes, and manually fetches changes from other copies. Git has become the de facto VCS tools used by new Open Source projects. It is supported on platforms including Github, Bitbucket, and Gitlab and is used by projects like the Linux Kernel, the Go language, and of course Git itself. It is not the only VCS out there. Your future job may require you to use a different tool for VCS. Thankfully the principles of SCM are very similar everywhere you go, so pay attention! There’s a lot to learn here and it’s not all about the commands you should type. Before using Git we need to make sure we have it configured. We will do this by telling Git what our name, email, and preferred text editor is. $ git config --global user.email "myself@gmail.com"
First we will create a repo. In Git a repo is just a directory that we have run git init inside of. $ cd my-project    # Always run `git init` inside of a project folder! $ git init         # Never inside of your home directory. Next we are going to add a file to our project. This is as easy as creating it, staging it (git add <filename>) and committing it. $ git commit  # Edit message in Nano, save the file, exit to commit. $ git checkout -b "new-branch"
Checkout a new feature branch on your repository. $ git checkout -b "add-awesome-feature"
Create/Edit files on the new branch. $ git commit -m "Short awesome commit message"
View the diff between the two. Locally merge the changes from your new branch into Master. Do not delete the .git directory. The .git directory is the file which contains your entire Git repository. All history and metadata about your repo is kept in that folder, deleting it deletes your project except for the code you have right now. You will eventually learn some commands to modify history (change commit messages or changes in a commit). You can do this but you should only do it with caution and only when you fully understand what you’re doing. It has the potential to ruin other people’s day. Do not make redundant commits or revert commits. After making a commit, use git commit --amend if you want to make changes to avoid cluttering your history with Oops, changing that messages. Don’t wait too long between commits. Commits are cheap and you can never make too many. If you wait too long you might as well not use it! Once you’re done with a feature you can squash many commits into one. Avoid redundant copies of the same work. If you want to make changes to something, but also want to keep the original, make a branch! There are very few cases where making a copy of something in the same repository is the best thing to do. Don’t commit secrets. They never go away. Everybody uses VCS differently. Choose the workflow that works best for everybody involved. Unfortunately we can’t really prescribe a best Git workflow. There are definitely better workflows out there, but you should do what works for you, and when you join a project explicitly ask what their workflow is so you can stay on the same page as your peers. Open Source, free to run, feature rich. Very popular. Not Open Source but free for Open Source projects. Also popular, similar to Github, unlimited free private and public repositories. Bare-bones. Fewer features than the previous three. Open Source, useful for learning the nitty-gritty on how Git really works. Each of these services is either free to use, or Open Source (so you can setup and run it yourself). To contribute to someone else’s repository you first need to clone the repo. Once you clone a repository you can make as many local changes as you want without affecting the original (central) copy. You can experiment and work without the original owner even knowing what you’re doing! In this exercise we will clone an application and run it in our remote GNU/Linux box. First, clone the tinsy-flask-app repository from the DevOpsBootcamp organization on Github. See http://git.io/vcVmB for more details about the tinsy-flask-app repository. After cloning we need to setup the project. This is similar to building an application from source because we downloaded the source code and want to run it! Most repositories include a file called README which includes instructions on how to setup and run the code included in the repo. Those instructions tell us to run the following commands. If you are using our docker image, you won’t be able to access the webserver without adding a port forwarding rule for TCP port 8080 on the container, similar to how SSH is forwarded on the container. See ‘Setting up Docker’ on the left for info on how to add port mappings to a docker container. You may need to install the python, virtualenv, and pip packages. How would you do that? Now if you go to <your ip address>:<http port> in your web-browser to see a live version of the app! This is a portal to all of the official docs on git-scm.com. It includes everything from Getting Started to Git Internals. Check it out! This is the tutorial provided on https://git-scm.com/about/distributed. 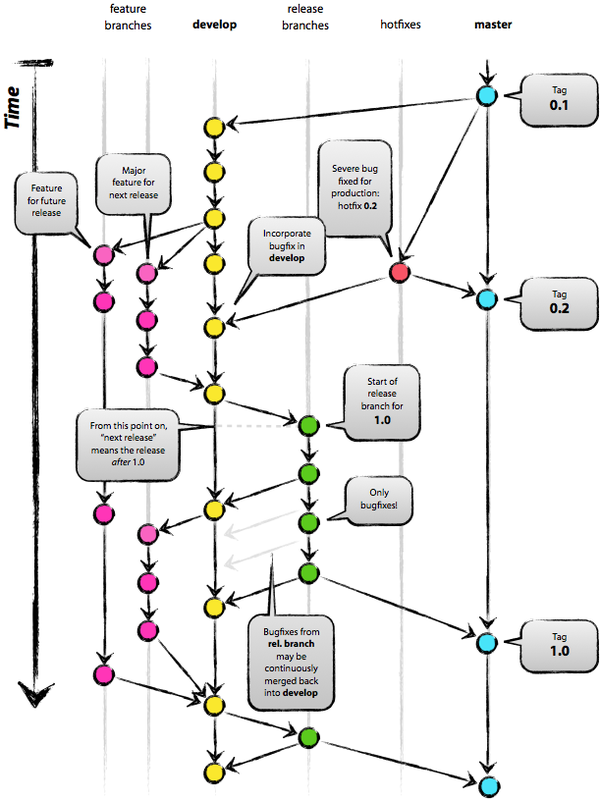 It is a good high-level overview of some common git workflows. This blogpost describes a git workflow (git-flow) that the Open Source Lab bases their workflow on.